It’s Queen Titania and King Oberon’s 1000th jubilee, and the seven Party Fairies are in charge of making the celebrations extra-special! But naughty Jack Frost has decided to sabotage the celebrations by stealing the Party Fairies’ magic party bags. 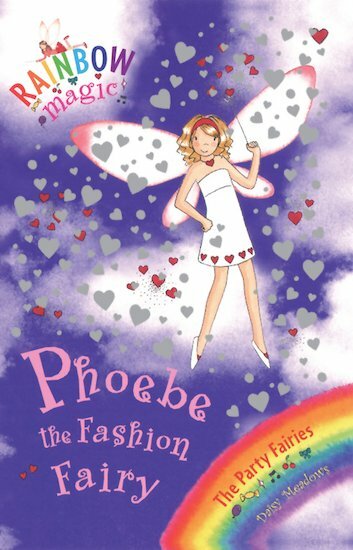 Can Rachel and Kirsty help Phoebe the Fashion Fairy to rescue her party bag, so that all the guests at the special celebrations can wear their most beautiful, shimmering gowns? Pheobe makes sure all people have something nice to wear when they go to parties. Best book in the pack!!!!!! This book is Fashiontastic!!!!!! :) Really Good! I`ve read this book! Its very fun to read because kirstys and rachels friend, charlotte got her dress ruined! read the story and it will be interesting! I LOVED THOSE DRESS THAT PHOEBE GAVE CHARLOTTE, KIRISTY AND RACHEL BUT I LIKED CHARLOTTES MOST. well on the cover it looks you good and im not into fashion but i love seeing fashion models! I liked this book because there are some really pretty pictures in the book. I rate this book 5 stars out of 5 stars. I have read this book and it is fantantic and brillant. Also I liked the bit about when a lady called Mrs Ingle who was iceing fairy cakes.